After the beheading of 21 Egyptian Coptic Christians by the terrorist organization “Islamic State” (IS), who had been seized in December and January from Libya’s eastern town of Sirte, Egypt has retaliated with airstrikes in Libya beginning of this week (see: Erin Cunningham and Heba Habib, “Egypt bombs Islamic State targets in Libya after beheading video“, The Washington Post, 16.02.2015). So far, the US-airstrikes on IS targets in Iraq and Syria produced only – if at all – minor signs of progress. Even if the airstrikes are one of the necessary instruments against IS, there have additional measures to be taken. To exclusively rely on airstrikes could turn out as an strategic error in the long run. Six months and 16,000 airstrikes into the campaign to defeat the Islamic State, with less than 1% of the territory it held in Iraq recovered, an honest accounting leads to only one conclusion: The U.S.-led strategy is failing. With the effort focused almost exclusively on a military defeat of the armed group, also known as ISIS, neither the Iraqi government nor its anti-ISIS allies – Iran included – have seriously addressed the reforms and accountability for abuses that could earn back the support of Iraq’s Sunni population. The fragmentation of Iraq’s fighting forces into unaccountable sectarian militias responsible for horrific abuses against Iraqi civilians is part of Iraq’s slide into a broken state that no amount of foreign aid and military intervention will be likely to put back together. — Sarah Leah Whitson, “Why the Fight Against ISIS is Failing“, Human Rights Watch, 18.02.2015. This cartoon was drawn by Tomas, a self-taught cartoonist from Rome. His cartoons range from computer graphics to traditional ink drawings, and have appeared in Italian newspapers, as well as in various sites around the Internet, including his blog which contains an archive of all cartoons realized from 2009. 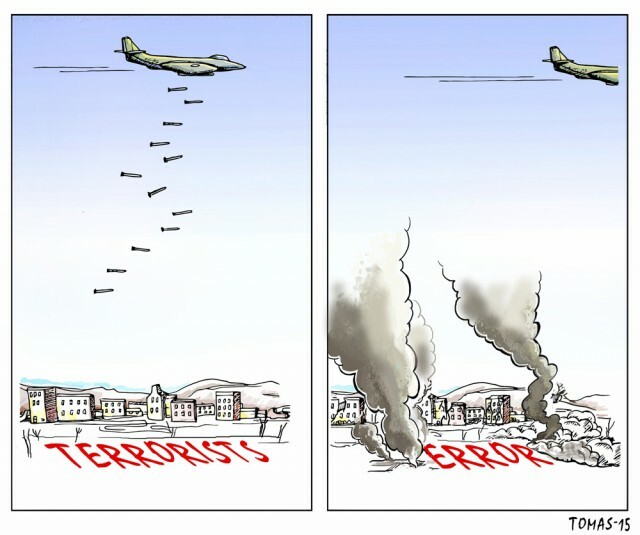 This entry was posted in Cartoon, Egypt, English, Iraq, Libya, Security Policy, Syria, Terrorism.